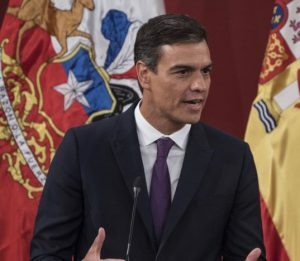 Spain’s Prime Minister Pedro Sánchez has come out in defence of Pablo Llarena, the Supreme Court judge summoned to appear in a Belgian court as part of a lawsuit brought by Catalan independence leaders in exile. ‘It’s not a private matter but one of state,’ said Sánchez. While on a visit to Chile, Sánchez said that defending judge Pablo Llarena is a defence of the Spanish judiciary: ‘The State must defend the jurisdictional sovereignty of Spain when it is questioned, which the government has been clear about since the beginning,’ he added. The Spanish government announced on Sunday that it had taken the first steps to hire a Belgian firm of lawyers to ‘defend Spain’s interests’ in the case against Llarena. Yet, the Ciudadanos (Cs) and People’s Party (PP) opposition parties criticised Sánchez’s government for ‘abandoning’ the judge. Meanwhile, the issue of the lawsuit against the judge took a controversial twist when some media outlets reported that comments made by Llarena, upon which much of the suit is based, were wrongly translated and attributed words to the judge that he did not say. The PP opposition party used the news of the error to hit out at the Sánchez executive, calling it ‘worrying’ that the Spanish government had not detected the translation mistake. PP and Cs have begun initiatives in both houses of the Spanish parliament in defense of Llarena. Later on Tuesday, the Catalan government spokeswoman Elsa Artadi said that Madrid’s move would ‘break the law’. She said that, according to Spanish law, judge Llarena should have requested legal protection to the Spanish government within ten days after the lawsuit was filed. Instead, he took around two months. ‘Before there had been no exceptions as this would have meant breaking the law,’ said Artadi.